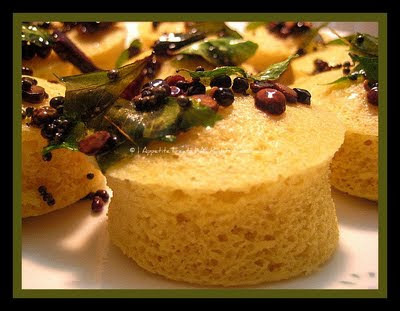 The Indian Cooking Challenge for July is Khaman Dhokla. This is my first challenge and the first time ever i made Dhokla. I enjoyed challenge as well as the dish. The Dhokla was very fluffy and very delicious. 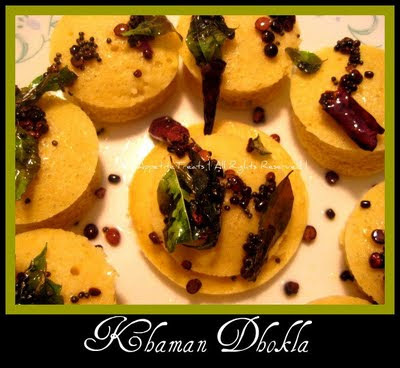 I steamed my dhoklas in the idly moulds and then cut into small rounds using a cookie cutter. Mix first 1/2 cup curds with 1/2 water. To this add the besan and mix well to get a lump less batter, the consistency should be of idli batter, more of dropping not pouring consistency. Slowly add more water if needed else, add the soda. Keep it aside to rise for 1 hour. If you are using a pressure cooker, fill the pan with water, place a plate over which you will have to use a plate for steaming the dhoklas. Thali plate can be used for steaming. To the batter mix in the citric acid, oil, salt, sugar, green chili paste and turmeric powder. Mix well. This has to be done just before pouring to the plate. Meanwhile have the pan on stove, and let the water start boiling. When the water reaches the rolling stage, you can mix the eno to the batter (Save little of eno for dusting on the plate), mix gently, you will see bubbles coming out. Dust or sprinkle the plate with eno. Then immediately pour the batter to the plate. Place the plate carefully inside the pressure pan and cover with lid. You need not use the whistle. After covering you will find steam coming out of the outlet, simmer and don't disturb for almost 5 -7 minutes. After 5 -7 minutes, remove the lid and proof it using toothpick or knife. If the knife comes out clean and does not have any batter sticking, then its done. Cover back and let it remain on flame for 1 min and switch off the gas and allow it for 5 minutes. Remove the plate from the pan, pour the water and oil mix over the top. This is a different shape for dhokalas..looks yummy !! amazing shape...u havent mentioned how u made those shapes...excellent choice of presentation!! looks cute and very fluffy. yum! Thats a great idea to steam them in the idli moulds. The dhoklas look so cute and yumm. u have a wonderful space Sathya! guess wat i just made the dhokla...i didnt have Eno, so they puff as much..but the taste is excellent...wonder if they fluffed, they would be better than the freshstore bought. Nice round ones. :) lovely !! Wow looks awesome.. different shape from usual one... fluffy and looks perfect. Wow the Dhokla has come out so well...I like the cute shape of dhokla..I am sure my kids will like it..gr8 idea of using idli moulds..